UCSC Arboretum – The Arboretum at UC Santa Cruz is one of the hidden jewels of the university and indeed, the town itself. (For the uninitiated, an arboretum is a collection of trees and plants.) The gardens are full of plants from around the world, particularly other temperate climates similar to ours like Australia and New Zealand. 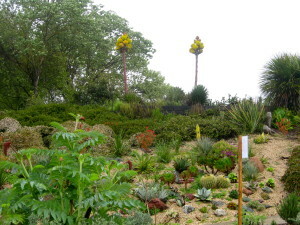 (There is also a large section of California natives.) You’ll see plenty of birds swooping through the air around the trees, particularly hummingbirds. You can find maps, hours, and more information about the arboretum here. Natural Bridges State Beach – Natural Bridges is also on our list of best local beaches and for good reason: not only does it offer one of the nicest beaches, but it also offers plenty to do around it. In addition to the beach, you can visit the Semour Marine Discovery Center, check out the local tide pools, and in October, you can visit the eucalyptus grove to see the migrating monarch butterflies (a highly recommended experience). Since the beach is a the end of West Cliff Dr., there’s also the option of walking along the path that follows the coastline from Natural Bridges to the Boardwalk. Museum of Natural History – Another great spot to visit for families with young kinds, the Museum of Natural History, is located near Seabright beach. It offers displays and presentations that explore the coastal community, whether that be plants, animals, or humans. It’s been around for over 100 years and is sometimes referred to as the “Whale Museum” due to the large whale sculpture in front of the building. The museum is located at 1305 East Cliff Dr. and close at 4 p.m., 5 p.m. on weekends (closed Mondays). The Mystery Spot – One of our kookiest attractions is the Mystery Spot, which you’ll likely notice displayed on a bumper sticker on cars around town. Essentially, it is an old cabin in the woods that seems to defy gravity, due to an optical illusion created by a downward slope that appears to go upward. As a result, water can be seen appearing to flow uphill and visitors can stand upright at bizarre angles that do not seem possible. Definitely a treat for kids to take in, as well as the adults. Roaring Camp Railroads – Roaring Camp is a passenger train located in nearby Felton. There are two main routes that it runs: through the forest and to the beach. The holiday lights train is also quite popular around Christmas time, when you can packed train cars on the tracks that run through downtown. A great experience for kids and adults alike! You can find more information about tickets and pricing here. 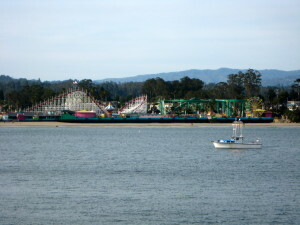 Beach Boardwalk – The classic amusement park on the beach, the Beach Boardwalk is one of the most popular attractions in town. It’s often filled with visiting tourists and out-of-towners, but make no mistake, locals like the Boardwalk too. Admission is free and there are tons of rides you’d find at larger amusement parks, in addition to the Giant Dipper, one of the oldest wooden roller coasters in the world. There are also more kid-friendly rides, as well as a video arcade, beach, and plenty of places to to grab a snack or meal.